Kathi and I were feeling a little under the weather with head and chest congestion on Tuesday, but it became necessary to do some laundry, so we took our clothes to downtown Georgetown to a laundromat. We had lunch at Dos Salsa for a cheese enchilada lunch and returned home to rest. We stayed in all afternoon and all day Wednesday. AJ was at his apartment in Austin feeling about the same as we were. Beautiful day on Monday, before the winter wind came. 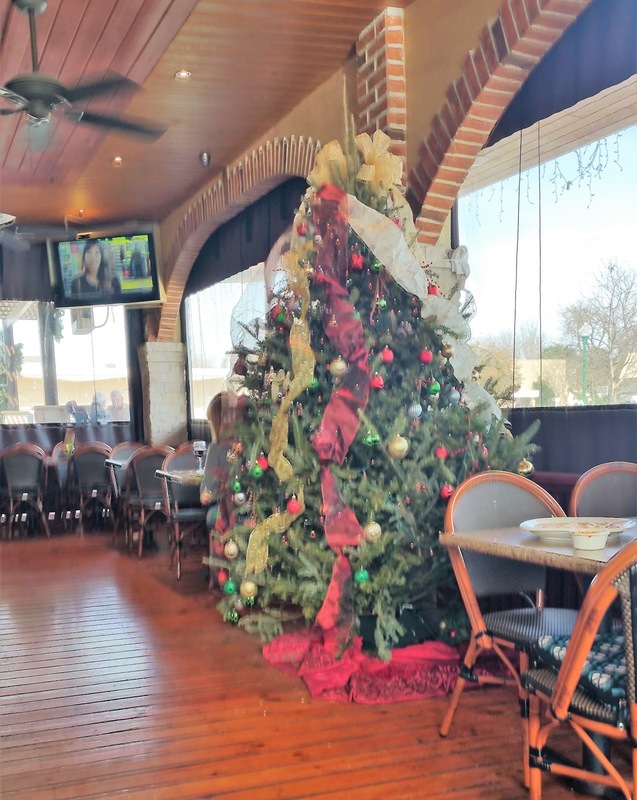 Christmas tree still up on the patio at Dos Salsas. Thursday, January 5 we were all feeling a little better, so Kathi and I drove into Austin to pick AJ up for lunch and some errands. I opened the door to our RV and was hit with icy, cold wind. It seemed to clear my sinuses and make the rest of my body shiver. It was cold. We had spent Wednesday night with space heaters running, so the temperature was not such a surprise, but the north wind sure was. 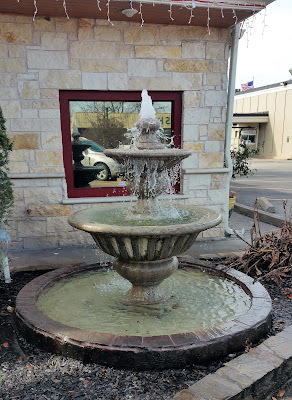 Friday was going to be our last day in the Austin area, because we wanted to find someplace warmer. We had to leave Cedar Breaks Park, because they had no spaces available over the week end. 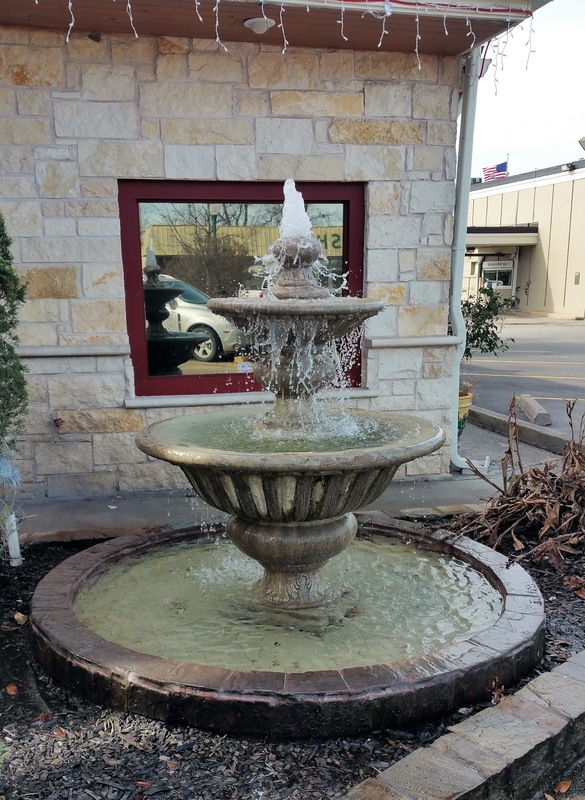 We were not sure where we were going, so we assumed south toward San Antonio would be warmer. Everyone wanted breakfast so we drove to Buda for breakfast at Cracker Barrel. There was a Walmart store near the restaurant, so we stopped there to pick up some groceries for AJ. Kathi started feeling a little worse as the afternoon wore on, so we finished running errands and dropped him back off at his apartment. 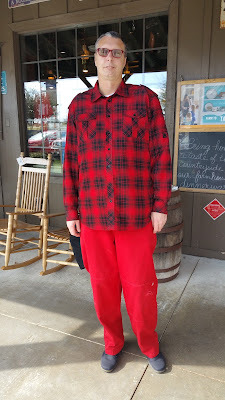 AJ in warm clothing at Cracker Barrel. He is a bright young man. I checked the weather and found that no matter which way we went we could not avoid freezing weather on Friday or Saturday. 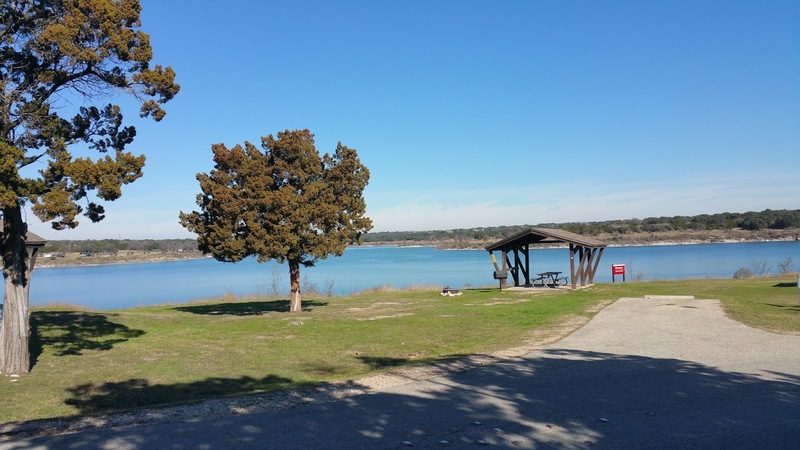 We agreed, staying in the area made just as much sense as moving, so Kathi called a few local RV parks and everyone was full. We drove to Catfish Parlour for lunch. Kathi had catfish and I had a combination of catfish and popcorn shrimp. Lunch was filling and we were driving back to Cedar Breaks when Kathi broke a tooth. That solved our travel dilemma. We need to get back to the Houston area so Kathi could see her dentist. We got home and started calling RV parks where we usually stay and there were no spaces available anywhere. Kathi called The Happy Oaks RV Park in Columbus, where we stayed on the way to Lake Georgetown and they had a space available, so we suited up and hit the road. This RV park is actually in Alleyton, but that unincorporated community is so small, it does not show up on the map. 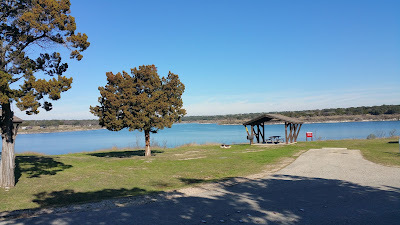 We spent last night in Happy Oaks and we are waiting for the temperature to get above freezing so we can take showers and hopefully be ready to move into the Houston area on Sunday. We are currently looking for an RV park for a home tomorrow. We may have to say in Alleyton a few more days unless we get lucky this afternoon and find a place with space available. Obviously, the RV salespeople have been making a killing the last few years. I am glad the parks around the Houston ship channel are full. That means there is a lot of work going on. This used to be too far south for the snowbirds, but since Al Gore changed the weather patterns, who knows anymore. Wherever we are is home, so we do not worry about it too much. Fair skies, open roads, and tailwinds to you, my sweet friends! Always great to hear from you, Pete. Thanks for reading my blog.